If you are looking for the best places for a white Christmas in Europe, look no further! 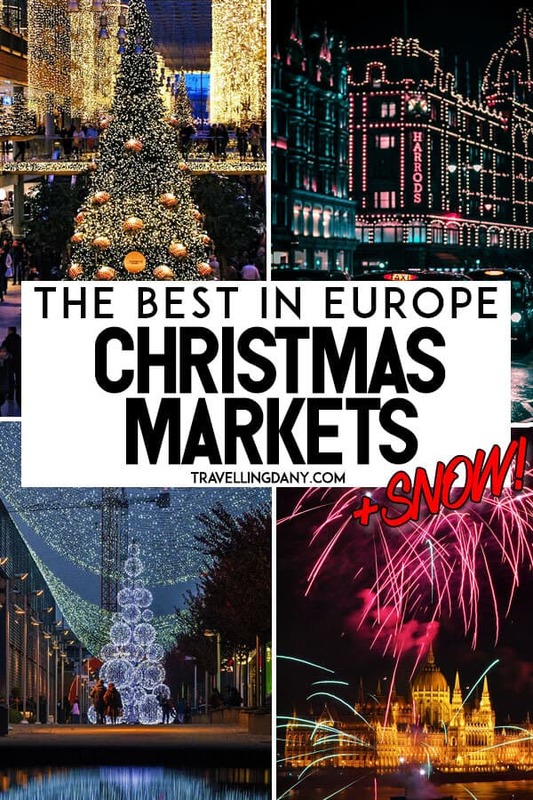 We’ve listed here the best European cities that offer the perfect Christmas feel, to get the once-in-a-lifetime experience you’ve always dreamed of! Do tell us: what are your best places for a white Christmas in Europe? We have already talked about Vienna: in our opinion, it’s one of the European cities that becomes even more beautiful during the festivities and in my opinion one of the best places for a white Christmas in Europe. If you have already read our article about the best Christmas markets in Vienna and you are wondering if it’s one of those places where you can live a fairytale white Christmas, the answer is … yes! 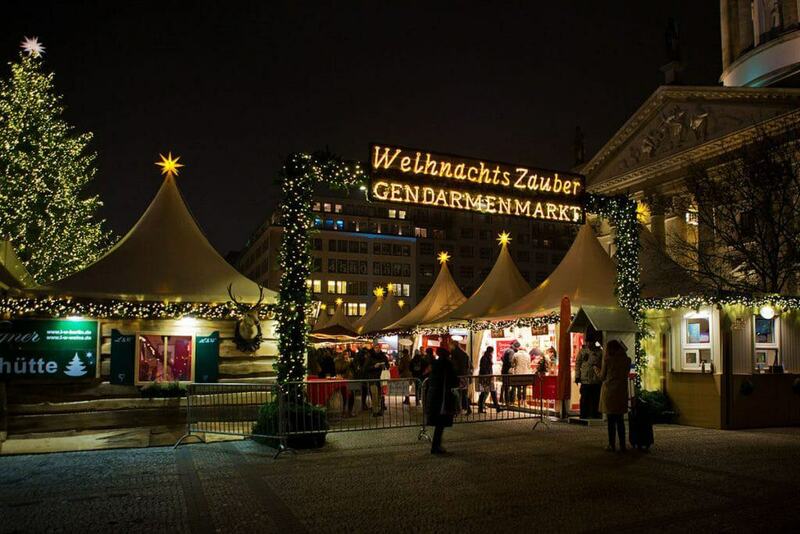 You will also easily find here the best Christmas markets in Austria. Vienna in December is very cold, but not as much as January. At many markets in the Austrian capital (but not only there) you will be able to taste the traditional Christmas street food. Typically, it’s hot stuff as roasted chestnuts or mulled wine, that the Austrians use to fight the temperatures generally going down below zero. If you were looking for snow, you definitely won’t be disappointed. In fact it might snow nearly every day with just a few hours per day of sun. But don’t worry, you just have to be prepared to make sure the low temperatures won’t ruin your Christmas vacation. 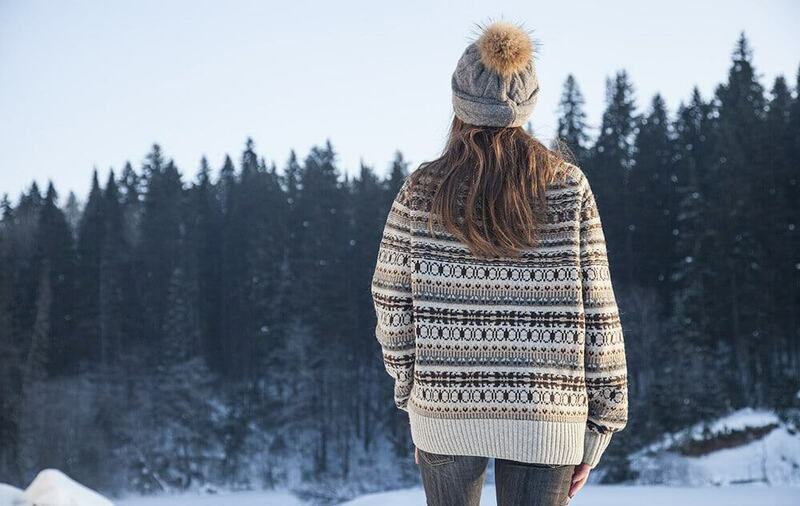 Pack your luggage with the right Winter clothes and bring a raincoat with you, so you won’t get your hair wet because of the snow (it’s quite unpleasant, been there, done that!). On bank holidays restaurants and hotels will be open, but the shops are always closed. However, you won’t miss too much your shopping session. 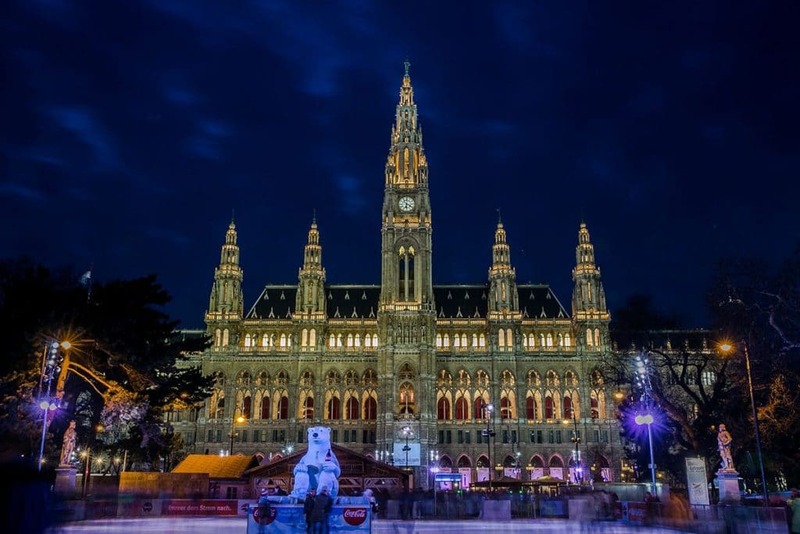 At Christmas you will in fact be able to attend (mostly for free) Christmas carols and events not only at the Christmas markets in Vienna, but also in many of its magnificent Churches. The best way to visit Vienna is using the public transport. Here you can buy a discounted Vienna City Card for unlimited rides on metro, buses and trams. It also offers over 210 discounts at experiences, museums and shops! I strongly advise you to book a table in advance at the restaurant where you want to eat at Christmas, or you won’t find place anywhere! Vienna can get pretty crowded during the holidays. In our opinion, Vienna is one of the best places for a white Christmas in Europe: it’s a holiday the Austrians seem to love, therefore you will always find the best decorations, the best Christmas gifts and the best events during the holidays. If you are looking for a tour of the Christmas shops with a local guide that speaks English, you can book it here. 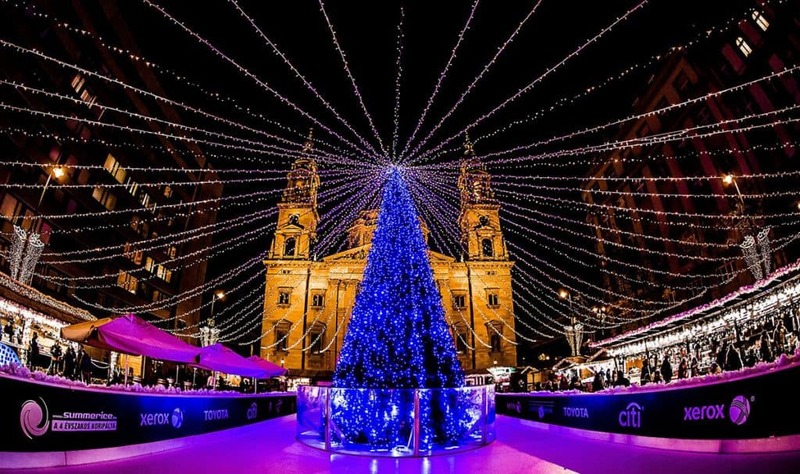 The spectacular Budapest (Hungaria) offers several Christmas markets, at the city center and in the outskirts. Just like the Christmas decorations, you will find them from mid-November to the end of December. Two of them are the most awe-inspiring and loved by tourists from all over the world. The Christmas market in Vorosmarty square is situated in Budapest city center and dates back to 1998. It’s generally open from the 10 November to the 31 December. The second one is the one situated in front of St. Peter Basilica and it’s open from the 24 November to the 1st of January. These are two of the best places for a white Christmas in Europe because no matter what, the atmosphere will never disappoint. The first one is often believed to be the only Christmas market in Budapest, maybe because it’s the one that has a nice fairytale feel, and it’s also very colorful… and crowded. The air is full of Christmas scents, cinnamon above all, because it’s largely used in the traditional Hungarian pastries. Even if it’s a pretty touristy Christmas Market, it has an almost vintage feel. You won’t find plastic lights or huge (and horrible) Santa’s at every corner. They tried in fact to preserve the beauty of the historical buildings in the area, so on the front of Cafe Gerbeaud, a building that dates back to the 19th century, there’s a laser light show every night. It represents the traditions that this Budapest Christmas market wants to show to its visitors. Here you can buy a discounted Budapest city card for unlimited free public transportation. The Christmas market in front of St. Peter Basilica, one of the tallest buildings in Budapest, is managed by the National Association of Folk artists. Its members come here to sell high quality crafts representing Hungarian history, culture and traditions. 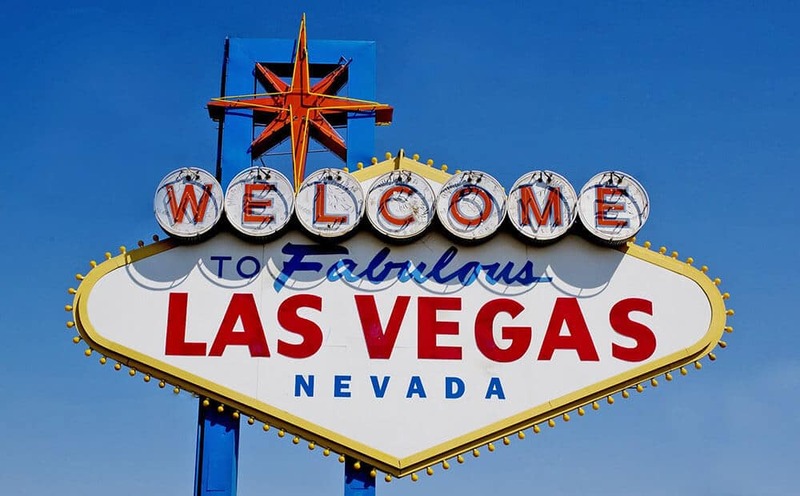 It’s the perfect place for you if you intend to buy souvenirs or Christmas presents! I added Budapest (here a useful guide on what to do in the city) to my list of the best places for a white Christmas in Europe because not only you will surely find lots of snow, but the two markets are within walking distance and thus it feels like the whole city becomes one huge Christmas village. Just think that the Christmas market in front of St. Peter Basilica has over 100 stalls, street food… and a beautiful ice skating ring in St. Istvan square! In case you want to book something special for Christmas eve, here you can book a river cruise down the Danube enjoying a dinner with traditional Hungarian cuisine! Full disclosure: snow in London isn’t going to happen for sure in December. With the global warming the temperatures aren’t as cold as they used to be, so it’s much more unlikely than it was a few years ago. Yet I couldn’t just skip London. The city becomes awesome for Christmas (even more than it usually is! ), full of lights and decorations. Planning a weekend in London in December might be expensive, which is why we prepared a very useful article on a budget trip, and a useful list of the best London photography spots, with alternatives for the crowded places and a printable map! One of the things you absolutely can’t miss during a Christmas vacation in London is Winter Wonderland. Hyde Park not only has a nice Christmas market, but also the most decorations (festive lights, mostly). If you go over there, be prepared for lots of Christmas carols, handmade gifts… and crowds. Unfortunately! But it still is one of the best places for a white Christmas in Europe, crowds or not! Leicester Square also dresses up for the holidays. They generally have the usual Christmas market stalls, Santa’s grotto and a vintage Speigeltent, which is a velvety, wooden, mirrored place where you will be able to assist to a very busy programme of Christmas cabaret by the Underbelly team. If you want something even bigger, Southbank Center is the right place for you. 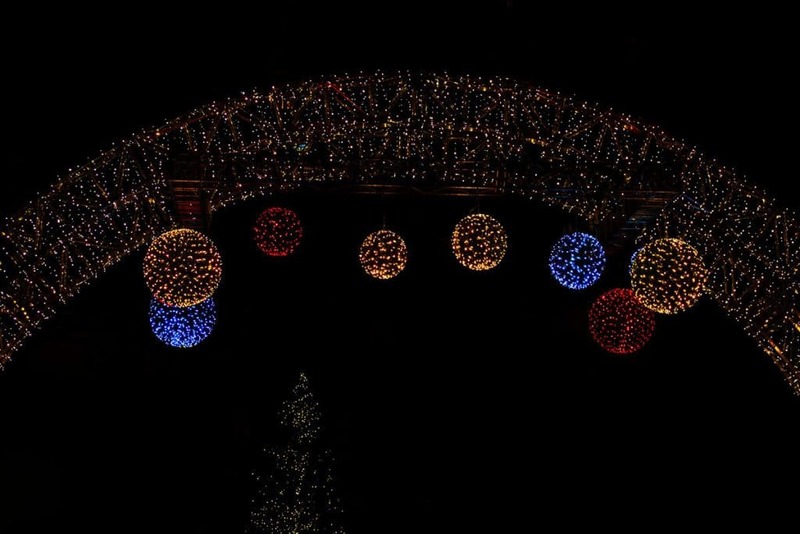 Sweet treats, seasonal Christmas shows, lights and lots of fun, especially (but not only!) for the little ones. But London is a multicultural city and thus they found a place also for Christmas markets representing history and traditions from other countries. Just like the Scandinavian Christmas market, in front of Rotherhithe’s Finnish and Norwegian Churches, with Scandinavian treats, decorations, musical performances and gifts. Or the Danish Christmas market, at Hampstead villa, which turns into a little piece of Denmark, with Danish carols, hot dog stalls (the real stuff! ), Danish crafts and lots of delicious food. And let’s not forget the Jolly Hobbies Japanese Christmas market at Crouch end! 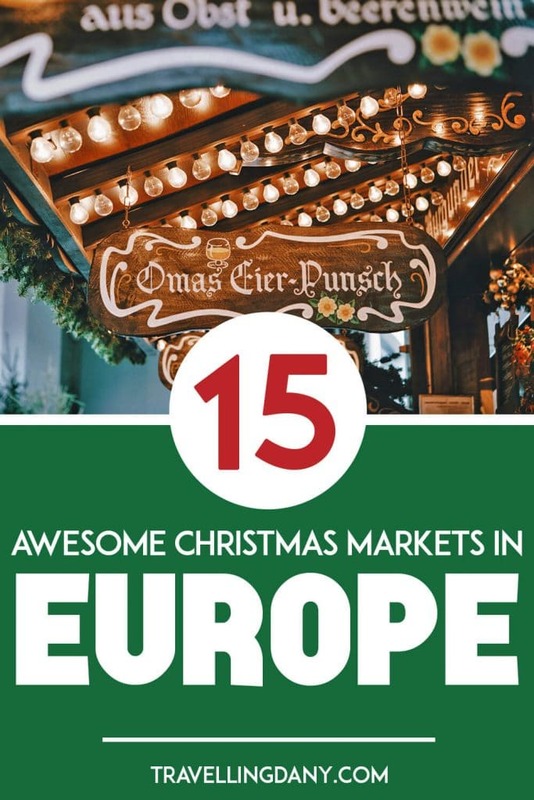 So many Christmas markets from all around the world in one place… which is what makes it one of the best places for a white Christmas in Europe, right? If you’re tired of walking around, here you can book an awesome tour of the Christmas lights in London with an open top bus: like a pro! December in London is also the time of the year where you can find the best festivals. 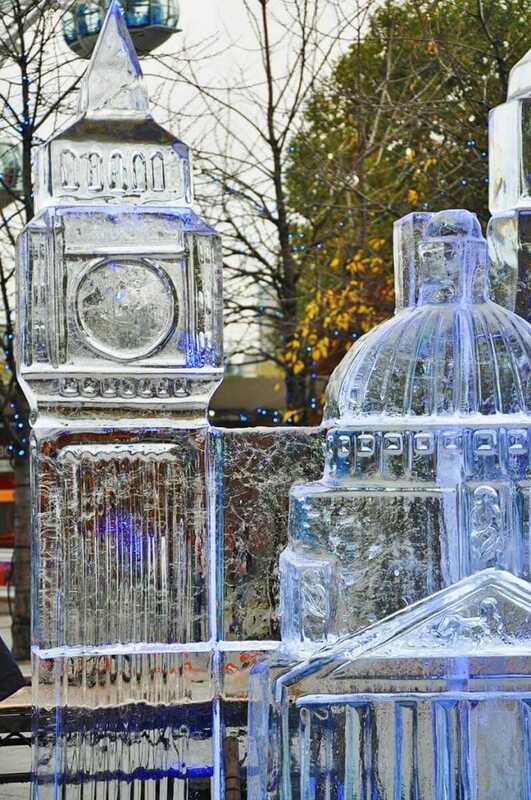 Like the Greenwich Wintertime Festival, the one place where you will find snow in London. At the Old Royal Naval College, beside the Cutty Sark, there will be in fact artificial snow, a covered ice skating ring and of course also a Christmas market. Two more highlights of this period are the Massive Arts Christmas Fayre at the Ritzy and the Portobello Winter Festival at Portobello Green. There’s also the chance to buy tickets for a magnificent tour that will pick you up from your hotel in London to attend the Christmas day service at Canterbury Cathedral, and after a tour of Rochester, you will have a traditional Christmas lunch with al the trimmings. Before to return to London, you will be taken to Dover to see the famous White Cliffs. You can click here to get a discounted price for this Christmas tour! Another interesting activity is attending a Christmas tea in London. I asked for info to David Angel of Delve into Europe, as he’s a London expert, and here’s what he told me. Afternoon tea in London should be on every London bucket list. Most of the luxury hotels offer it, as do some of the city’s grand department stores. And they don’t come much grander than Fortnum & Mason, which has been open since 1707. Fortnum & Mason’s venue for afternoon tea is the Diamond Jubilee Tea Salon, which was opened in 2012 by Queen Elizabeth II. It was built 307 years ago and has been an apartment, an antiques department and a restaurant in its time. The store has been selling tea since 1720, and they even have tearistas to guide you through the extensive tea menu. The food is just scrumptious – a mixture of finger sandwiches, scones with clotted cream, jam and lemon curd, and a selection of patisseries and cakes. Their afternoon tea doesn’t really change in the run-up to Christmas, but the store does very much. It’s beautifully decorated for Christmas, and full of great Christmas gifts including some delicious hampers. They also sell tins of special Christmas spiced tea to keep you warm during the festive season. How could I not add London to this list of the best places for a white Christmas in Europe? After all… there will be artificial snow anyway, and so many things to do! Besides, last Christmas we had snow even on Mount Vesuvius in Naples (Italy) so… fingers crossed! In Prague, just like London, there’s no guaranteed snow at Christmas. Sure, finding some is definitely more realistic than expecting it in London, but still, don’t plan a trip here if you only want to have some snowy fun. In my opinion, because this city is so evocative at Christmas, there’s still plenty of reasons for you to decide you want to spend your holidays there, which is why, snow or not, I wanted to add it to my list of the best places for a white Christmas in Europe. If you’re planning to spend a couple of days in the area, here’s a Prague itinerary you can use to get the most out of your trip. The most important feature of Prague is the true Christmas atmosphere, scented with cinnamon and clove. Wherever you go for your self guided walking tour of the city you will find mulled wine, delicious trdelnik (sweet pastry), hot mead and the famous juicy ham they cook here. The Bohemian Capital can be delicious during the holidays, so you can read our guide in case you want to taste the best traditional dishes in Prague. Here you can get a discounted price for a Prague Card for 2, 3 or 4 days, to get unlimited use of public transport, discounts and free entry to several monuments. The Christmas markets in Prague are in fact the most impressive in the Czech Republic: they lit up the city, bringing locals and tourists together in what feels like a Winter Wonderland setting. They are open from 2nd December to 6th January, including on Christmas Eve, Christmas day and New Year’s day. The most popular and largest one is usually held on Old Town Square, which becomes one huge Christmas village and the main centre of Christmas celebrations for the whole December. There are a lot of reasons why visiting Prague in Winter can be a great idea, here you can read our guide to learn more about the weather, what to pack and what to eat. 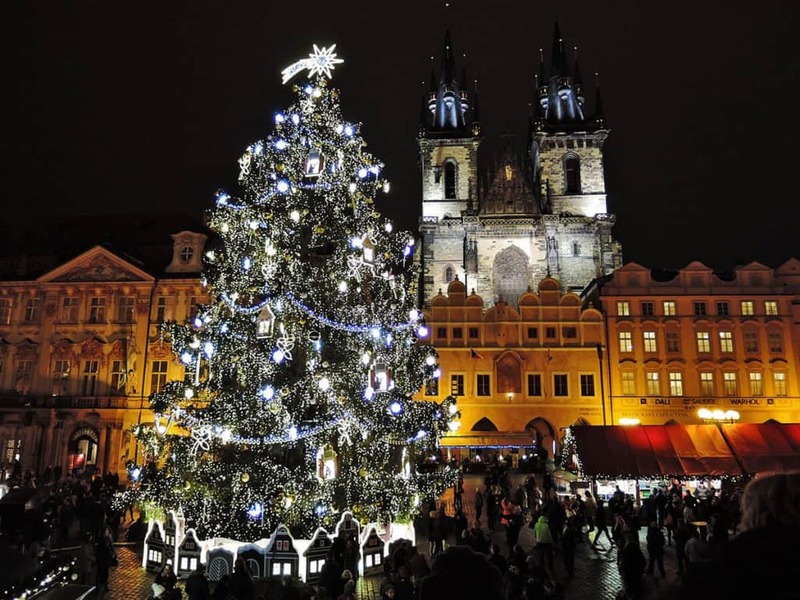 Old Town Square in Prague is dominated by a huge Christmas tree that every year is selected from a different region of the Czech Republic. At the stalls you will easily find great Christmas presents, souvenirs and traditional arts and crafts such as sword making. Kids especially love to pet goats, sheep and donkey at the animal stable here, representing the Bethlehem scene, with Mary, Joseph, baby Jesus and the Three Kings. Because Prague can be particularly expensive during the holidays, we prepared an in depth guide to Prague districts to help you find a good hotel according to your budget. Just like Vienna, Bratislava deserves a special mention in our list of the best places for a white Christmas in Europe. Here in fact you won’t have any problem in finding lots of lots of ice and snow! If you already read my guide to Bratislava Christmas market, you will know that to save a lot of money and visit more European capitals during the festive period, you can decide to find a hotel in Bratislava and move to Prague and Vienna by train. If you go to Bratislava during the Christmas holidays, beware: it might be even too cold for your likings! Yet this city has a magical feel when it’s covered in snow and ice, all lit up with the Christmas lights and decorations. In front of the town hall there’s always a huge Christmas tree and some of the biggest hotels also have awesome trees or wintery scenes to decorate the hall. 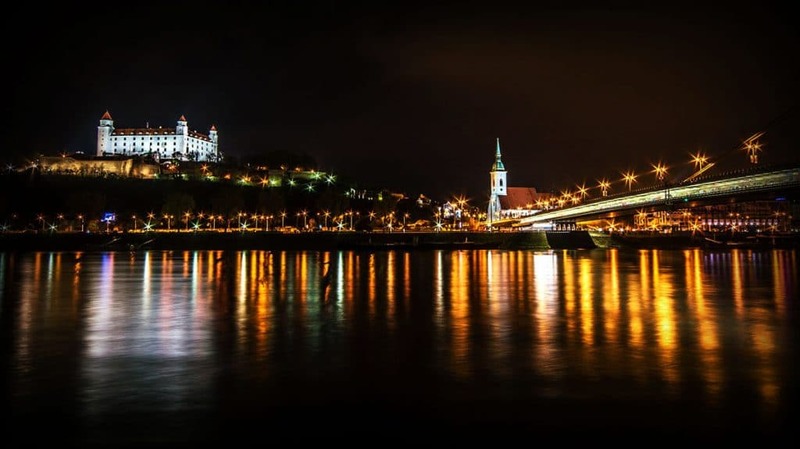 In case you prefer to visit Bratislava on a tour with a local that will show you a different side of the city, with all the places tourists know nothing about, you can book one here. The air at Bratislava smells like good food and mulled wine. Locals here like to eat a slice of fried bread with a generous serving of caramelized onions on the top, while drinking their mulled wine. It’s also the perfect place where you can buy handmade Christmas presents without spending a fortune. I bought a bunch of handmade wool scarves for just a few Euros! Another one of the best places for a white Christmas in Europe is Tallinn, in Estonia, where snow during the holidays is always guaranteed! The Tallinn Christmas Market is colorful and with a touch of fairy tale. It’s held every year at the Town Hall Square, where you will also find a huge Christmas tree, the most important one in Estonia. The tradition of decorating a Christmas tree in the Town Hall Square dates back to 1441, making it the first one of its kind in Europe! The Christmas market is open from the 17 November to the 6 January, with about 40.000 led lights and a stage decorated with over 600 Christmas stars: it’s simply majestic! If you intend to spend a few days here, you can book a 3 hour medieval walking tour to see the best sights of the city: with all the Christmas decorations and the snow it’s even the more beautiful! The cobblestone streets and the rooftops in Tallinn are layered in white and the whole town has this vibe that makes you feel like you are walking through an animated postcard. Strings of lights illuminate cafe windows and little shops, and candles flicker on the tables as you sit for a traditional dinner, while outside the snowflakes fall lazily on the singers who perform Christmas carols. In case you are a foodie like us, you can book a food tour of Tallinn to taste the best dishes and wine, or warm up with a tour to explore the Estonian craft beers in a cozy cafe near the Town Hall. 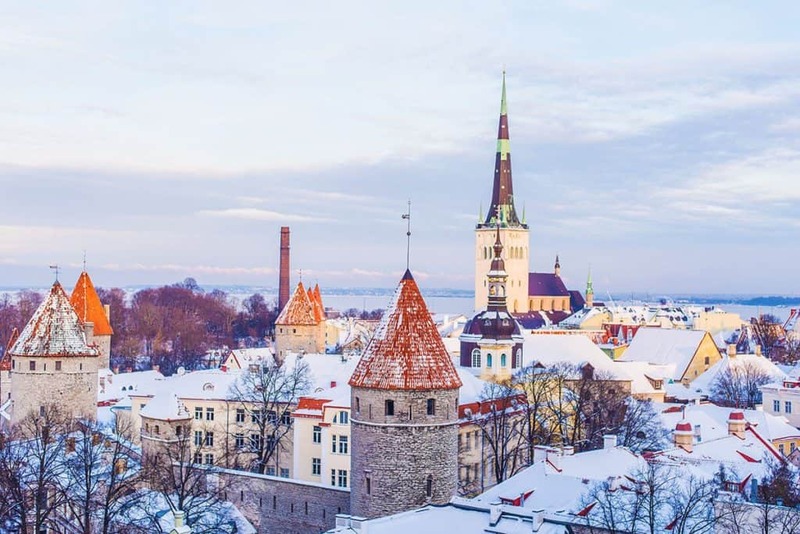 Christmas in Tallinn is always an unforgettable experience, so much so that Tallinn has been named the number one best value destination in the world to visit in 2018 in Lonely Planet’s Best in Travel, featuring the best destinations in the world that should feature on every wanderluster’s bucket list. So it’s not only one of the best places for a white Christmas in Europe but for a trip throughout the year, according to the experts! Christmas markets in Berlin are a huge deal. From the end of November (generally the 25th) to the early days of January, tourists and locals get spoiled by the awesome scent of food, mulled wine and colorful lights. If you want to save on public transport, your best bet is buying a Berlin Welcome Card to get unlimited transport options for the AB or ABC zones. Especially in the evenings the streets are busy with people from all over the world who come here to enjoy the festivities, even if it’s cold and there are good chances at snow every year. Yet this isn’t the only reason why I added Berlin to my list of the best places for a white Christmas in Europe. December is in fact stuffed with fairs, festivals and Christmas markets. You just have so much on your plate that you’ll even find it difficult to choose. From the Arts and Crafts Christmas market Frohnau, with approximately 140 artists who sell their creations, to the Fairy Tale Christmas Market at Jagdschloss Grunewald, in front of a Renaissance palace, the oldest surviving one in Berlin. They even have an environmental Christmas market, with trendy hip Berlin designer pieces, not to mention all the fun rides, ice skating rings, Christmas choirs and shows. In case you are planning to explore Berlin at Christmas in an unusual but fun way, you can opt for a 4.5 Christmas boat tour on the Spree river. You will be able to opt in (or out) for a delicious dinner and party hard with people from all around the world. Or even better, explore the city the hip way on a legendary VW T1 Samba bus on a 2 hour tour that will show you about 50 of the best sights in Berlin! Berlin is indeed the place to be if you want a busy Christmas, but I suggest you to either plan well in advance where you want to go, or to add a couple of nights to your stay, just to make sure you won’t miss anything! It might be one of the best places for a white Christmas in Europe, snow and all, but you won’t want to regret not having visited somewhere you really wanted to go to! 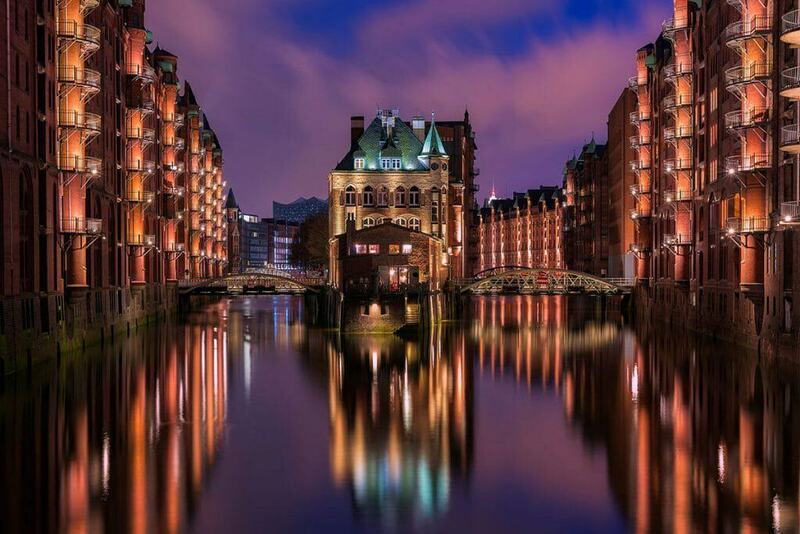 If you like this image, you can take yours as well during an evening illumination Speicherstadt cruise! Hamburg is quite famous for its food markets, but it’s also the second most important city in Germany for the Christmas markets tourism. While snow isn’t guaranteed in December, experiencing the Winter magic in Hamburg is a once in a lifetime thing. I decided to add it to my list of the best places for a white Christmas in Europe because, just like Berlin, it offers so many activities and things to see that it’d be crazy to miss it. The best way to explore it is by using public transport: you can book here a Hamburg Card at a discounted price to save money and get free access to buses, trams and metros. The beautiful architecture offers the perfect backdrop, all lit up with led lights and decorations. The prettiest Christmas market in Hamburg is in fact set in front of the Town Hall, and it’s been lovingly designed by Roncalli director Bernhard Paul. 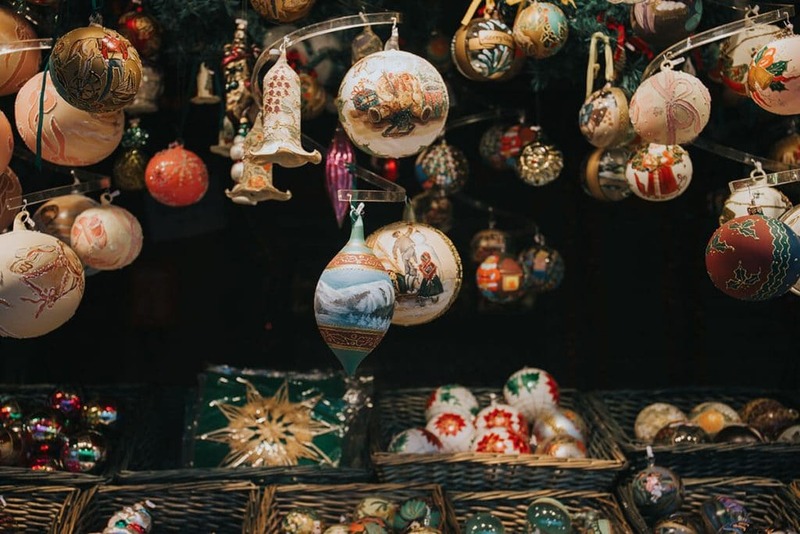 You will find woodcarvers from Tyrol, gingerbread bakers from Aachen and Nuremberg, silversmiths, sword makers and many others in this Christmas market that mixes history, tradition and heritage: it’s one of those places where both kids and adults alike just go insane! Christmas season in Hamburg is full of parades, festive shows, but also shopping, sightseeing and activities that never forget that there are so many children attending: again, plan wisely your schedule before you get there! If you are going to spend Christmas in Hamburg with your kids, you might want to check out this offer to enjoy the Disney musical Aladdin at the Neue Flora Theater in Hamburg: talk about awesome Christmas presents!!! If you have been reading my blog for a while, you’ll know that I fell in love with Krakow at first sight. Unexpectedly, too, since I thought that Warsaw was the place I liked the most in Poland! While maybe a visit to Auschwitz-Birkenau isn’t exactly something you want to add to your Christmas schedule (or is it? ), I can tell you that Krakow offers so many nice things to do for the holidays. And not only Krakow! If you are staying a few days, in fact, I strongly suggest you to visit Zakopane and the Tetra mountains, which is the local’s favorite place to enjoy the snow during the Winter season. Here you can book a day trip with pick-up from your hotel to Zakopane (a few bonus are included too!). Krakow Christmas market generally opens the last week of November and lasts at least until December 26th. Sometimes they keep it open until January 6th, just like when we’ve visited the city, but it’s not a given thing. You will find it on the evocative Rynek Glowny, in the Old Town, where all the major events in Krakow take place. At the wooden stalls you will find a wide range of Christmas decorations, gifts, sweet treats and traditional foods. Eating in Krakow is very cheap, and the food is to die for: with the Christmas market in Krakow this is even the more true. The street food will warm you up, together with the mulled wine, and you will be surprised, just like us, at how inexpensive it is. There’s even the chance to learn how to cook a few traditional Polish dishes with a 3.5 hour home cooking experience! It always snows in Krakow in December, so it’s one of the best places for a white Christmas in Europe, especially if you are looking for a destination which is beautiful and not overly expensive! Frankfurt Christmas market is one of the most beautiful in Germany, and even if snow isn’t always a given at Christmas, I couldn’t avoid to mention it in my list of the best places for a white Christmas in Europe. Mostly because it’s one of the oldest Christmas markets in Germany, and it has a breathtaking backdrop. Let’s face it, Frankfurt is a pretty town. Add wooden stalls, lights and decorations to that and you’ll have the perfect place to put you into a very special festive mood. The market is open at Römerberg, St Paul’s Square, Mainkai (Main Quay), Hauptwache and Friedrich-Stoltze-Square from November 27 to December 22. Which is the one thing that many people don’t like. When I talked about this to a local, he told me that Christmas is a holiday they like to spend with their families and thus almost everything shuts down, including the Christmas markets. 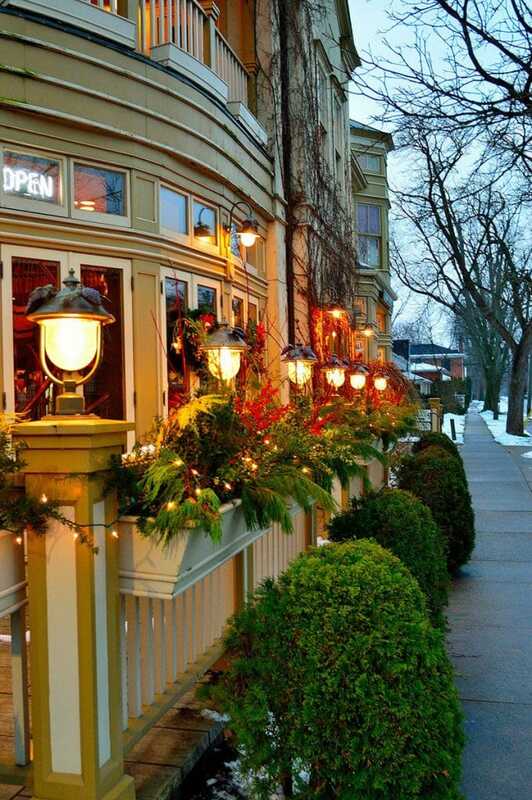 Because it might be difficult to find a table at any restaurant for Christmas, make sure to either book one well in advance or to book a hotel that includes a nice dinner. Many pubs will open after dinner anyway, because Frankfurt is a lively city, so it’s likely that you will find lots of young people going out after spending some time with their families. The best way to explore Frankfurt is by using public transport. If you buy a Frankfurt card (here at a discounted price), you’ll have free public transport during your stay and also discounted prices at museums, shops and restaurants. And in case you like history just like us, there’s also the chance to add one day to your visit to enjoy one of two day-trips. The first one explores the one of Germany’s best-preserved medieval towns, Rothenburg, and the second one will show you the imposing Eltz Castle on the Moselle, always from Frankfurt. Both are magical at Christmas and make Frankfurt one of the best places for a white Christmas in Europe! Yet another German city made it to our list of the best places for a white Christmas in Europe: Dresden. One of its Christmas markets, the Dresden Striezelmarkt, is the oldest in Germany (over 500 years!) and probably the most popular one. You can find it at Dresden Altmarkt square from November 29 to December 24. If you like Christmas, you will fall in love with Dresden. This baroque city is in fact the perfect backdrop for the perfect Christmas: you will find about eleven Christmas markets in this city, from traditional ones to medieval markets… yet another city where it’s difficult to choose where you want to go! Yet if you prepare a good itinerary right after booking your trip there, it is possible to plan a self guided walking tour, using the public transport, so unless you plan to stay very long in each one, you should be able to visit at least a few of them, so a careful planning is mandatory! As usual, I strongly suggest you to buy a Dresden City Card to explore the city using unlimited public transport: it will save you a lot of money! The Christmas season in Dresden is particularly enchanting, because of all the decorations, the snow and the special festive events that introduce the visitors to Saxon Christmas traditions and culture, through food, arts and crafts. For example you could enjoy a beautiful evening at the impressive Marble Hall in the Zwinger with a festive Christmas concert, to listen to Vivaldi, Bach and Mozart. Or you can experience a 3-hour culinary tour in the historical Baroque Quarter in Dresden, with a delicious Bohemian-Saxon food tour and an off the beaten path tour of the city with the night watchmen: it will be very engaging and fun! Hygge is a Danish and Norwegian word that I’m not sure can easily be translated. It can be described as cosiness and that “feel good” vibe that you get when you are very happy. Christmas in Copenhagen embodies this concept: both locals and tourists enjoy themselves in a cozy and easygoing setting. They even organize foodie tours of the city, at some of the best restaurants, which include culture… and so much hygge as well. Tivoli Gardens is a must visit place in Copenhagen, especially during the festive season, because it becomes a white Winter Wonderland. This Copenhagen Christmas Market is probably the most crowded one during the holidays but you just can’t help going there, it’s too beautiful! Copenhagen is an expensive city, so to save lots of money, the best option is to buy a Copenhagen City Card. It includes not only free public transport rides, but also free entrance to over 73 museums and attractions, as well as discounts on many restaurants. Here you can buy it at a discounted price. Kronprinsensgade is a narrow street in Copenhagen, decorated with thousands of small led lights that look like a starry roof over your head. 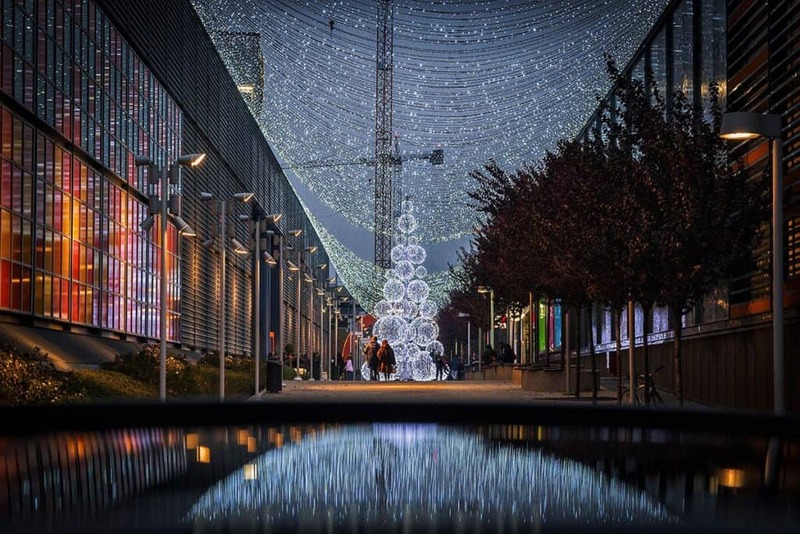 It’s a good place not only for some seasonal shopping, but also to take a few pictures: this is one of the most Instagrammable places in Copenhagen, especially at Christmas! My favorite place to go yet is Kogens Nytorv square, where you can see the best Christmas displays in Copenhagen. Hotel D’angleterre always offers a themed display with light curtains that transform its facade in a theater, but almost every shop and hotel here shines with lights and decorations. Did I mention that it’s my favorite part of Copenhagen during the Christmas season? No wonder that I added the Danish capital to my list of the best places for a white Christmas in Europe! If you aim to take awesome pictures during this trip, join a professional photographer for a 3 hours photography night tour: the results will be fabulous and you’ll have fantastic memories on paper of your Christmas in Copenhagen! Among the very best places for a white Christmas in Europe you can find Riga, in Latvia. With its Old Town Christmas fair, the roasted almonds and the local handcraft, it offers the visitors the chance to find their Christmas miracle every day. The seasonal program is always stuffed with workshops and concerts (classical music too, but mostly Christmas carols) and the city is tiny enough that you can visit just using public transport or walking around. In the city center there are Christmas markets on Dome Iakumus and Līvu laukums, two beautiful squares, and at Esplenāde Park. I’d pay a visit especially to the last one as it has a cute “village” populated by rabbits: let’s face it, not only kids love this kind of things! They are all open from early December to early January. The traditional treats include mulled wine, gingerbread, roasted almonds, but also smoked meats. At the Christmas markets you will also find nice – and locally produced – presents and souvenirs. Patterned mittens, candles, but also Latvian honey, socks, hats and scarves. Spending a Christmas vacation in Riga also means learning about the Latvian traditions, that don’t only include food and crafts but also things like log dragging and local Christmas songs. There’s also the chance to go on a dog sledding adventure in the Latvian’s countryside (which is amazing) or to experience a new kind of game that is gaining popularity: the Labyrinth Game. With your group you’ll have to solve riddles and explore the city, collecting points to win: it’s a fun family activity too! Helsinki is officially considered the “Christmas City“. After all, here they are used to substantial snows in time for the holidays, making it one of the best places for a white Christmas in Europe and it’s also one of the most beautiful. While it will be very cold, Winter is probably one of the best seasons to visit Finland, because Christmas is a the most heartfelt festivity here. To the point that, to be able to spend Christmas with their family and still have fun during the holidays, Finns have a “pikkujoulu“. It’s a traditional party that anticipates Christmas in a highly festive, informal way. The Christmas markets in Helsinki bustle with energy, and because of pikkujoulu, they don’t stay open for long. Generally only for 10-15 days and never later than December 22. Yet they’re not the only place where you can actually soak in the Christmas atmosphere. If you walk over at Aleksanterinkatu, named the “official Christmas street“, you will find beautiful shop windows and lights decorating the whole area. 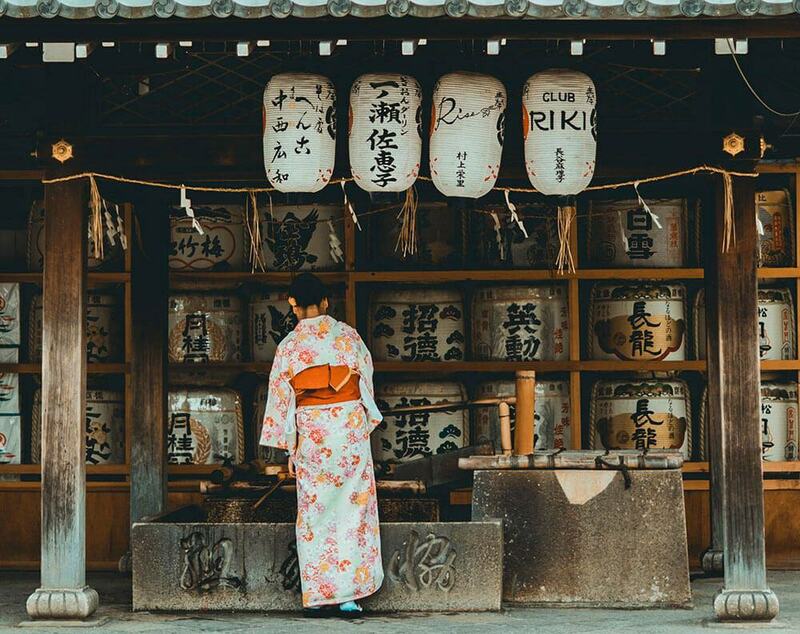 It’s the place where the locals go to do their Christmas shopping so chances are that you will find beautiful souvenirs and presents as well! You can buy here a discounted Helsinki City Card to discover Helsinki with free public transportation, enjoy a free sightseeing tour and receive discounts on restaurants, shops and tours. The traditional drink for Christmas in Finland is Glögi, made from spiced wine with a sprinkle of almonds, raisins and, if you want, a dash of vodka. After all, the sun is reluctant to rise as Winter starts to grip Helsinki, so you’ll have to keep warm somehow, especially if you’re planning to experience a forest bathing tour in the Kivinokka area. 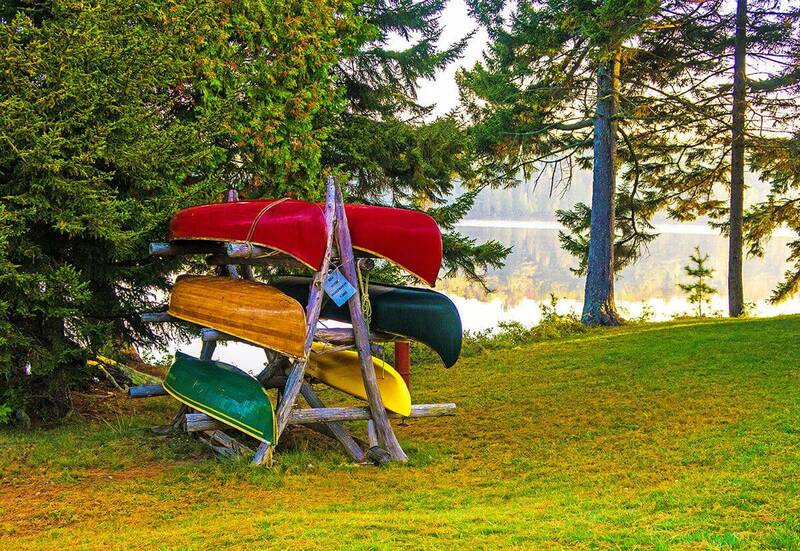 We talked about the forest bathing in the Adirondacks, it’s mostly the same thing, only you’ll have to bring warm and waterproof clothes with you! I’m sure you don’t want to stay sick in bed when you’re on a trip to one of the best places for a white Christmas in Europe! Being Italian I couldn’t avoid to add Milan to the list of the best places for a white Christmas, even if it doesn’t snow every year over there. My sister lives in Milan, so I’ve had my fair share of white Christmases with her, but it really depends. Again… global warming and pollution aren’t helping. At all! Here you can find a lot of useful information on Italy winter weather for your trip. The traditional Christmas markets in Milan are called “Oh Bej! 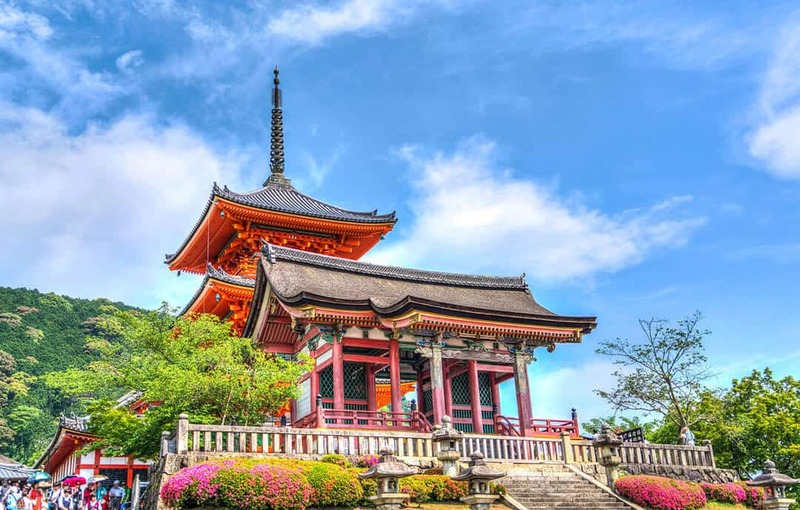 Oh Bej“, which is dialect and means “Oh beautiful!“. The name seems to recall the time when kids were all screaming “Oh Bej!” back in 1510, when the papal envoy Giannetto Castiglione was sent to Milan to give gifts to the kids there. Around the Sforza Castle there’s a huge Christmas market with almost 400 stalls. Many of them are traditional of Milan, so you will find artisans, florists, book sellers or toy makers, among others. They represent the ancient arts and craft of this beautiful city, with the castle that makes the perfect backdrop. Another Christmas market is located at the Public Gardens Indro Montanelli, where you will also be able to taste the traditional “Firunatt“, smoked chestnuts only sold during the holiday season. Lately they have even opened a “Green Christmas“, a Christmas market that celebrates a green lifestyle, held at the Fonderia Napoleonica Eugenia, an archaeological site. Milan at Christmas is a sight to behold, with all the lights and the decorations. And if you spend the New Years here, there’s a huge concert near the Duomo, which is completely free! This year there will also be a beautiful laser lights show. Mind you, it will be crowded but worth it! Besides, you can visit the best of Milan in one day if you don’t have much time. While here, you could take advantage of your Italian vacation to explore the Cinque Terre on a day trip from Milan, that also includes a mini cruise, to explore this UNESCO World Heritage site. Another suggested activity is a tour of Milan in a restored Fiat 500 at night, with an experienced driver that will show you the beauty of our city all lit up for Christmas. And if you want to surprise relatives and friends when you get back home, book a traditional homemaking pasta experience to learn how to make lasagna and pasta. So next year you will be cooking a perfect Italian Christmas dinner! And if you’re traveling with your significant other, make sure to visit the most romantic spots in Milan! The only thing you should remember is to apply our Italy tipping etiquette at all times to make sure you don’t come across as rude! If Europe isn’t enough, have a look at these unusual Christmas travel ideas! Packing light for the coldest month is still something that eludes you? Head over to our guide to packing light for Europe in winter to learn how to pack your things in a carry-on! What an amazing list of places. All of them seem to vie with each other in terms of their spectacular beauty during Christmas. For some reason, I think one place I would love to head to is Talinnn in Estonia. The place seems to have a fairy tale kind of ambience that makes it so appealing. It’s a medieval little town so it’s beautiful at Christmas! Honestly, I can’t figure out which of these I want to visit more! Prague sounds amazing (you mention some of my favorite scents in the world) but Vienna looks STUNNING – I could go on and on. The only trouble is that Luke and I are both from small families, and I’m pretty sure us leaving for Christmas would be a tough sell. Guess I’ll just have to keep living vicariously through your lovely posts! When we can, we travel with our family as well! Mom is also a wanderluster like me! What a great list! I have been to some of these and completely agree. Christmas in Europe is always magical. Thank you! Which one is your favorite? Thank you SO much for the info Jes! We’re meant to return to Poland, I’ve only seen Warsaw, Krakow and not much else, but I’ve loved it so far so we want to explore more. I’m noting down Wronclaw, hopefully in 2018 we can arrange another trip there! Looks like I’ve got the next 15 Christmas’s lined up as I’d need to spend time in all of these and couldn’t do it all at once! 🙂 There’s nothing quite like seeing the London lights (my mother-in-law has actually just sent me a photo of her in Oxford St yesterday with all the lights around her). But, as an Aussie who is usually sweating in 33+ degrees at Christmas time, in the pool and drinking very cold beer and wine, the thought of a magical, snowy white Christmas, tucked up inside in the warmth is very appealing. I’ve been in London for Christmas but never Europe (only been there late November). If I had to pick….Budapest and Dresden would be the places I would head to first. Absolutely beautiful article Danila. My mom is also a huge fan of London for Christmas! Oh. My. Goodness! 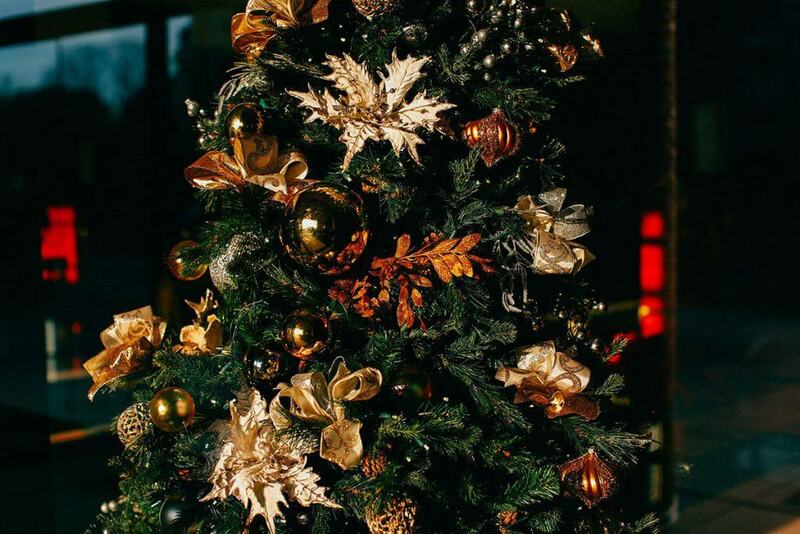 This article has totally put me into “the Christmas spirit.” Your photos are lovely, and all these places really know how to do a great Christmas celebration! Well Christmas is coming, right? I can’t wait! Wow this is such a great, comprehensive list and it really got me in the holiday spirit! I would love to visit one of these places for a white Christmas but Vienna is top on my list! Vienna is also my favorite! I used to live just outside of Prague but missed out spending Christmas there, I arrived in Feb so i’ll definitely have to visit there for Christmas one year. From this list however, I would have to chose Bratislava, I have heard amazing things about it from travelers I know. I can just imagine looking at the rooftops covered in snow would look majestic and almost fairy-tailish. I’ve spent winter in Queenstown (new,Zealand) so I’m sure I’ll be able to brave the cold haha. Also I’m curious to try the fried bread with onions, do you get a sausage with it too? Bratislava is lovely and also not expensive! And yes you can add also a sausage if you want, they sell several kinds, all fried or boiled! I still haven’t been to Valkenburg, that’s why it wasn’t in my list! Fingers crossed that I can go next year! I’ve realized myself that the cold isn’t too bad when you wear the right clothes! I’ve published my list of things to pack for a Winter trip too, hopefully it’ll be useful! 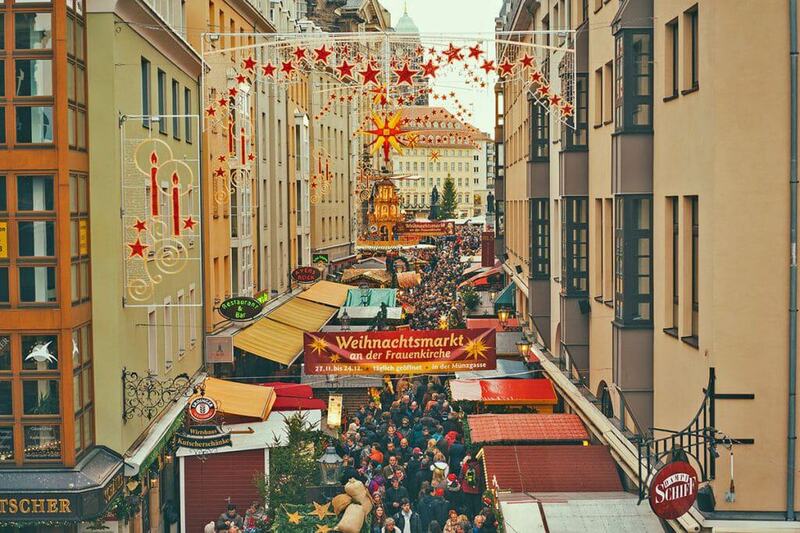 I didn’t even realize that Christmas markets were a thing until I started reading travel blogs… ha! Either they aren’t really a thing in the US or I’ve just been living under a rock. Based on your descriptions, it’s a tragedy that I’ve been missing them for all these years, they sound delightful! After reading your post I’ve realized that I absolutely must plan a winter vacation in Prague! Cinnamon smells, mulled wine, pastries, and juicy ham literally sounds like my idea of holiday heaven! Where are you from Val? I thought there were some in the US as well! Here in Europe they’re definitely a big tradition that we all love! And we also want to get back to Prague soon, it’s such a beautiful city! Wow thank you Claudia! And yes Milan is awesome, I’ll get back there soon and hopefully I can catch more of this beauty! Anywhere where I can get a glass of mulled wine and walk through a charming Christmas market…that’s all I want when I visit Europe in the winter! Right? I think Europe is the best when it comes to Christmas markets! Christmas in Europe is a dream I fear will never be a reality for me because I also really enjoy being around my family during the holidays. Nevertheless, Christmas in Vienna looks like a dream! Prague also seems like it would be so much fun…and Berlin would be so neat because Germany definitely comes to mind when I think of Christmas. The markets all seem so wonderful…and beautiful! We are the same, but my sister lives in Milan so we can’t always have that! Yet we also like to travel all together as a big family, or go slightly before/slightly after Christmas so we can still enjoy the atmosphere without missing our family dinners! You have quite the comprehensive list of countries here, wow where to start…I actually lived just outside of Prague but missed Christmas..However if I was to chose one it would be Bratislava. I’ve heard so many good things from people that have traveled there and to experience it at Christmas would be something special. I can just picture the roofs covered in snow making it feel like a fantasy film. I’mm also intrigued with the fried bread and caramelized onions, is there a sausage that comes with that? I’ve loved Bratislava myself! Here you can find my article on the Bratislava Christmas market, I hope it’ll be useful! It’s one of the most loved in Italy too, so yes, it had to be in the list! 😀 If you go to Berlin during the holidays then make sure to visit, it’s a bit crowded but SO beautiful! Every place looks so gorgeous I would have a hard time choosing where to go. Although it would be awesome to pick one every year. I think I maybe would start in Vienna, ugh I don’t know such a hard choice. I want to check out all of these holiday markets! Being in Europe for the holidays has been on my bucket list forever. I will make it happen and keep these places in mind, particularly Prague! Prague is definitely one of the best! Fingers crossed for you! Having stayed in areas with tropical climate all my life, I have almost never seen snow (except for once in Georgia-the country). White Christmas pics are so beautiful. My favorites among this list are Vienna, Tallinn, and Prague! Vienna is my absolute favorite too! Where are you from Panchami? Take me baaaack! I LOVE Christmas markets and I especially loved the ones when I was living in Berlin. Other than that, I’d say my top favorite that I’ve actually been to is in Budapest. Budapest is such a cute city! What a wonderful selection. I’ve been to several of these in the summer, but only to the Christmas Market of Vilnius in Lithuania in the winter, and of course London as I love here. I am pinning the list for some future December visits! I still haven’t been to Vilnius! How was it? Each place is more beautiful than the other. I have never experienced a white Christmas before but i can’t wait to do it sometime soon. Your photos are gorgeous. Europe is great for that, Christmas is very traditional and we love it that way! It’s difficult to go wrong with those! Vienna and Prague sound amazing! And how great that you have added Tallinn in Estonia. This used to be my home and I loved spending time at the Christmas market with hot mulled wine and beautiful handmade Christmas presents all around. This makes me miss white Christmas! You just can’t get into Christmas spirit in Australia. Tallinn is so beautiful that I couldn’t help myself! The architecture is beautiful and people are so welcoming! Besides… it’s SUCH a romantic little town!!! Bratislava and Krakow are less expensive than Tallinn 😉 While Germany and the Nordic cities are way more expensive 🙁 So if you don’t have a huge budget for the holidays, these two would be perfect, and maybe also Prague! Such a great compilation! I’m going to spend Christmas in London for the first time, so excited! Aw London!! How awesome! When are you going there? So many wonderful suggestions! I’d love to experience a Europe Christmas market in any city, but Helsinki and Coppenhagen are at the top of my list. It all sounds so magical! The Nordic cities are always so beautiful! I tend to escape Europe for the winter months because of the cold but then I do always get quite envious when friends share pictures of a beautiful snowy landscape… And especially around Christmas time, it just makes the holiday that bit more magical! I must confess that living in a quite warm area (south of Italy) I stil like some snow now and then! And as you said, at Christmas it’s even better! Loads of lovely suggestions for Christmas here! :) I’ve spent one in London and it’s absolutely beautiful! Thanks for sharing these, I feel inspired for where to spend the next few Christmases! I agree that London has such cute decoration, the whole city is amazing! 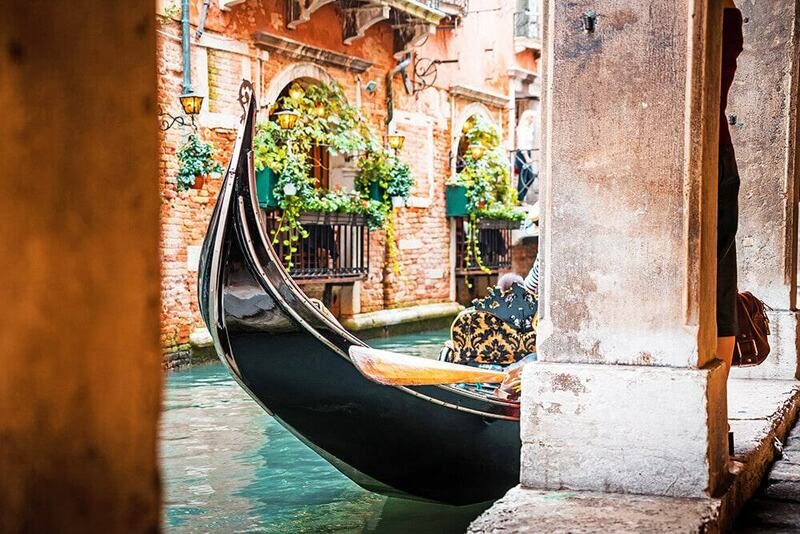 I’m ready to pack my bags for one of these places (or maybe a few!) for some Christmas festivities. Very informative post, Dany. Yay! Do you already have something in mind? I’m off to Vienna for the first time tomorrow for the Christmas markets so very excited to see you open with this! I’ve done London and Krakow at Christmas (as well as Bruges) but I intend to work my way through as many of these as possible! Have a safe trip Emmalene! I’m sure Vienna won’t disappoint! I’m intrigued by how so many people and travel bloggers that I’ve talked to, they always told me that Austria has the best Christmas market. I totally agree with this list! I got to do a river cruise around Christmas time a couple of years ago, and think my favourite markets were the ones in Vienna, Budapest and Nuremberg. Vienna are my favorite too, maybe it was because there was so much snow! But London is also very beautiful! We love visiting Europe during the winter! Experiencing the Christmas markets in Germany was one of our favorite trips – so magical – and I’d like to see the ones in Austria next! Oh Vienna is just so beautiful, you’ll love it! Tallinn looks like a beautiful place to spend Christmas, especially if snow is guaranteed! I’d love to walk around the Christmas market with snow on the ground everywhere. The city is small and so beautiful, especially in Winter!